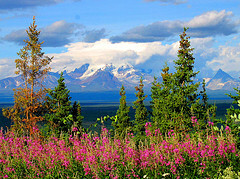 Sightseeing Trips and Glacier Flightseeing Tours from Chitina and Copper Center into the Wrangell and St. Elias National Park to McCarthy and Kennicott. Guided Ice Climbing Adventures on Root Glacier, Chitina River Rafting and Copper River Salmon Fishing Trips. Glennallen provides access to the magnificent Wrangell Mountains, a popular destination for backcountry recreation, superb sport fishing, river rafting and Native cultures. 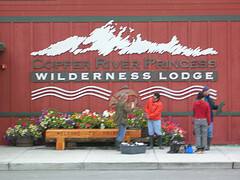 Copper Center - just few miles east of Glennallen, is the home of the ranger station for Wrangell-St. Elias National Park and Preserve, the largest national park in the United States. 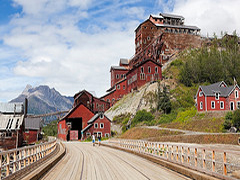 If you are interested to visit the historic mining towns of McCarthy and Kennicott, take the Edgerton Highway and the McCarthy Road for an exciting drive on a 93-mile paved/gravel road. Meet us around 9:05 am at the Chitina Airport and join us for a spectacular flight into the Wrangell-St. Elias National Park. Attend our Kennicott History Tour which includes a 2.5 hour guided tour of the Kennicott Mine and lunch at Kennicott Glacier Lodge. Use our shuttle and visit the frontier town of McCarthy. Explore the historic town built in the early part of the century. 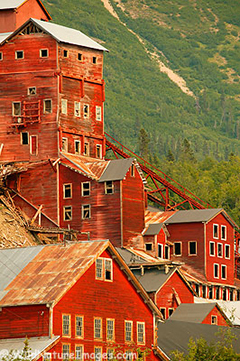 Copper was discovered on Bonanza Ridge and that discovery led to the development of the famous Kennicott mines. The boom town of McCarthy sprang up 5 miles away and became the miners town, with saloons, gambling and a thriving red light district. In 1938 the mine closed and left two "ghost" towns, right in the middle of what was to become the largest and most spectacular US National Park. Scenic return flight at 5:00 pm with the arrival in Chitina around 5:30 pm. We believe that Wrangell-St. Elias offers the best scenery in all of Alaska and combined with reasonable rates is the best flightseeing opportunity in Alaska. Our base at McCarthy offers us the advantage of being located right in the middle of Wrangell-St. Elias and surrounded by the largest collection of peaks over 14,000’ with more glaciers than anywhere in North America. From the moment you take off you are surrounded by scenery that will take your breath away. We can also arrange a custom tour of any length you want. We do recommend making a reservation to ensure the date and times that are best for you. Please contact us. In a little over an hour we will see 13 major glaciers, explore 6 valleys each with spectacular rock formations and view two major mountain ranges. With views in all directions our route is southeast to see the ruins of the Nizina Bridge (1920’s) and the massive Sourdough Rock Glacier. As we continue up the valley we’ll pass the mouth of the Chitistone Canyon and the Mile High Cliffs. As we bank to make the turn from the Nizina into the Chitistone Valley you will see how the rock formations change color and form and here you may get your first glimpse of Dall sheep. On the right is the Twaharpies Glacier tumbling off the University Range and out the left window are the Wrangell Mountains. Crossing Chitistone Pass the Russell Glacier and Mt. Bona (16,000’) dominate the view and as we turn to fly down the Skolai Valley your pilot will point out the beautiful Seven Sisters and picturesque Hole-in-the-Wall Glacier as well as the Frederika Glacier, the hanging glaciers on the Finn and the spectacular joining of the Rohn and Regal Glaciers below Chimney Mountain. As the flight continues you will follow the flank of Mt. Regal and see the West Fork ice falls, Stairway Ice Fall and the ogives of the Gates Glacier. We conclude the flight with close up view of Mt. Blackburn, Stairway Icefall, Erie Mine and the towns of Kennicott and McCarthy. Duration: 70 minutes from/to Chitina. If you want to experience the thrill of ice climbing in Alaska, this is the trip for you. Set amidst the stunning beauty of the Wrangell St. Elias National Park, the Root Glacier offers the perfect venue for people of all ages and skill levels to participate in this exciting and rewarding sport. Our experienced climbing guides have been leading mountaineering courses, backpacking tours and glacier ice climbing seminars in this remote Alaskan wilderness for over 30 years. You’ll be in good hands from the moment your guide fits you for your harness until you’re swapping stories in our office at the end of the day. We provide climbing options for everyone from the nervous novice to seasoned climbers with views of the 7,000 ft high Stairway Icefall, the 16,390 ft Mt. Blackburn and other surrounding peaks. Full day tour. 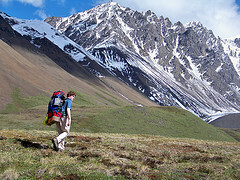 You'll start your day with a leisurely walk from our base in McCarthy to the lake at the toe of the Kennicott Glacier. During the half mile hike to the lake, your guide will share interesting local natural and human history, with a focus on the geology and glaciology you are about to experience up close. When you reach the lake, after a brief safety talk, you'll launch your kayaks and head off. The route changes daily, depending on the location of the best scenery, icebergs and cliffs. As you go, your guide will explain aspects of the glacial features you are seeing, and how this surreal landscape was formed. There are spectacular views up the valley towards Mt. Blackburn, the Stairway Icefall and the town of Kennecott. Part way through the paddle we'll stop for some hot drinks.